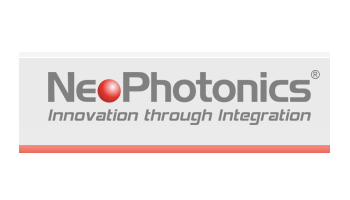 NeoPhotonics announced the commercial shipment of its suite of 64 GBaud optical components for coherent systems operating at 600G and 1.2T. The suite consists of three critical optical components: a 64 GBaud CDM (Coherent Driver Modulator), plus a 64 GBaud ICR (Coherent Intradyne Receiver) and finally an ultra-narrow linewidth tunable laser. NeoPhotonics said these components could be used for single channel 600G or dual channel 1.2T data transmission over data center interconnect (DCI) distances of 80 km. The components also support 400G over metro distances of 400-600 km using 64 GBaud and 16 QAM or 200G over long-haul distances of greater than 1000 km using 64 GBaud and QPSK. 64 GBaud CDM: NeoPhotonics 64 GBaud, polarization multiplexed, quadrature coherent driver modulator (CDM) is shipping in limited availability and features a co-packaged InP modulator with a linear, high bandwidth, differential driver in a compact package designed to be compliant with the anticipated OIF Implementation Agreement. Co-packaging the InP IQ modulator with the driver enables an 85% reduction in line card board space compared to equivalent lithium niobate solutions. 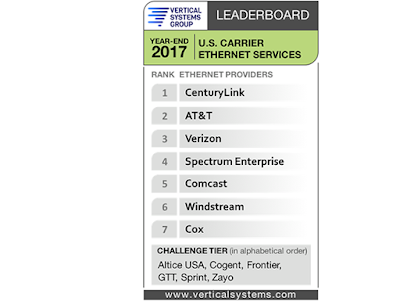 Furthermore, this facilitates transceiver applications up to 600 GBps on a single wavelength for next-generation transport modules..
CenturyLink has captured the #1 spot on Vertical Systems Group's latest LEADERBOARD of U.S. Ethernet market leaders. It is the first time a provider other than AT&T has led the benchmark ranking since 2005. 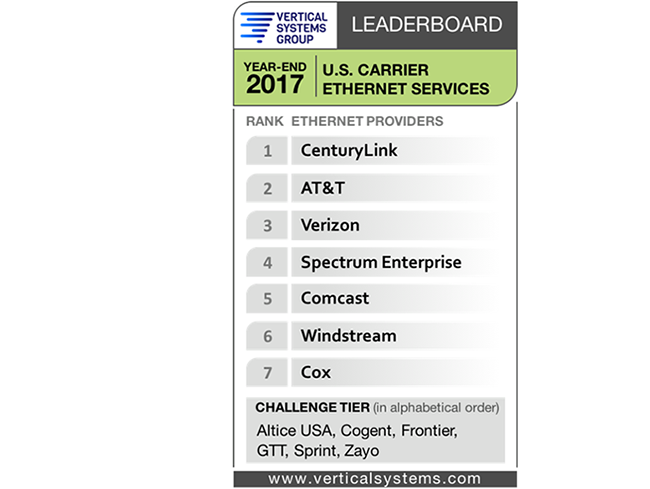 Seven companies achieved LEADERBOARD status for 2017 (in rank order based on retail port share): CenturyLink, AT&T, Verizon, Spectrum Enterprise, Comcast, Windstream and Cox. CenturyLink’s advance was driven by its November merger with Level 3, along with continued growth in Ethernet ports for both companies. Previously, Level 3 ranked second to AT&T and CenturyLink ranked fifth on the Mid-2017 U.S. Ethernet LEADERBOARD. To qualify for the LEADERBOARD, network providers must have four percent (4%) or more of the U.S. Ethernet services market. Shares are measured by the number of billable retail customer ports in service as tracked by Vertical Systems Group. The U.S. retail Ethernet port base grew 13% in 2017 and finished the year with more than one million ports. Seven Ethernet providers qualified for the 2017 LEADERBOARD, as compared to nine in 2016. The two company exits were XO (acquired by Verizon) and Level 3 (merged with CenturyLink). As a result, the U.S. LEADERBOARD has no companies from the Competitive Provider segment for the first time. Four Incumbent Carriers (CenturyLink, AT&T, Verizon, Windstream) and three Cable MSOs (Spectrum Enterprise, Comcast, Cox) are represented on the latest LEADERBOARD. Comcast had the highest organic growth rate of the LEADERBOARD companies in 2017, growing its base of Ethernet ports appreciably without an acquisition. Six Ethernet providers qualified for the 2017 Challenge Tier, as compared to four in 2016. New entrants Frontier and GTT moved up into the Challenge Tier from the Market Player tier based in part on acquisitions of Ethernet assets. These companies join Altice USA, Cogent, Sprint and Zayo. Each of the seven LEADERBOARD companies has attained MEF CE 2.0 Ethernet services certification, and each employs MEF Carrier Ethernet Certified Professionals (MEF-CECPs). Spectrum Enterprise leads with more than 800 MEF-CECPs, followed by CenturyLink with greater than 500. Companies on the U.S. Ethernet LEADERBOARD plus Challenge Tier employ more than one-third of the 5,500+ MEF-CECPs worldwide. In addition to the roster of LEADERBOARD providers, all other companies selling Ethernet services in the U.S. are segmented into two tiers as measured by port share. The first or Challenge Tier includes providers with between 1% and 4% share of the U.S. retail Ethernet market. For year-end 2017, the following six companies attained a position in the Challenge Tier (in alphabetical order): Altice USA, Cogent, Frontier, GTT, Sprint and Zayo. The second or Market Player tier includes all providers with port share below 1%. Companies in the Market Player tier include the following providers (in alphabetical order): Alaska Communications, Alpheus Communications, American Telesis, Birch Communications, BT Global Services, Cincinnati Bell, Consolidated Communications, Crowne Castle, DQE Communications, Expedient, FiberLight, FirstLight, Global Cloud Xchange, Great Plains Communications, Hawaiian Telecom, Logix Fiber Networks, LS Networks, Lumos Networks, Masergy, MegaPath, Midco, NTT America, Orange Business, RCN Business, Tata, TDS Telecom, Telstra, TPx Communications, Unite Private Networks, US Signal, WOW!Business and other companies selling retail Ethernet services in the U.S. market. 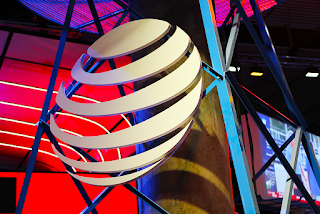 AT&T is expanding its SD-WAN –offer to more than 150 countries and territories. The AT&T SD-WAN – Network Based service was first launched in the U.S. in 2017. The service enables businesses to mix and match site types and connect AT&T VPN sites, internet protocol security sites and SD-WAN sites in a single VPN, while preserving MPLS features. It may also be integrated with AT&T NetBond for Cloud. 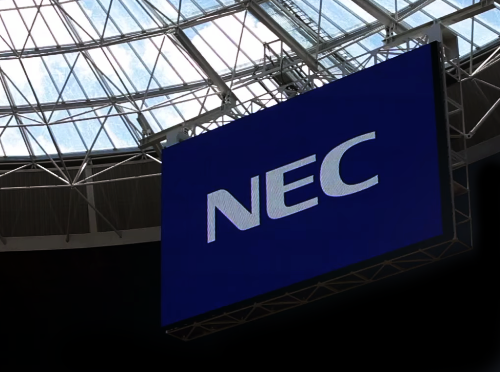 NEC announcedd a series of 5G verification experiments that it has conducted with NTT DOCOMO. (C-RAN) configuration. A Central Unit (CU) is used to control multiple DUs. NEC said its super high-frequency band, massive-element AAS base station system can improve the throughput of terminals located near the boundary of DUs' communication ranges (cells) that levering its advanced coordination capabilities. "NEC is committed to contributing to the successful roll-out of 5G in the near future, including these verification trials using the massive-element AAS base station system," said Kenichi Ito, Deputy General Manager, Wireless Network Development Division, NEC Corporation. "Moving forward, we aim to continue driving the advancement of high-speed, large capacity communications and sophisticated service functions that contribute to services provided by telecommunications carriers." Swisscom is accelerating its timetable for 5G by two years. The company says it now plans to roll out 5G at the end of 2018. Swisscom confirmed that Ericsson, its network equipment supplier, will deliver the first 5G hardware and software and implement it in the Swisscom mobile network this year. Switzerland’s first 5G mast will be tested in Ittigen. However, development of an extensive and fully efficient 5G network is dependent on a moderate amendment of regulatory parameters. In the summer of 2016, Swisscom, Ericsson and EPFL (École polytechnique fédérale de Lausanne) launched the "5G for Switzerland" programme to jointly conduct research on the new mobile communication standard. 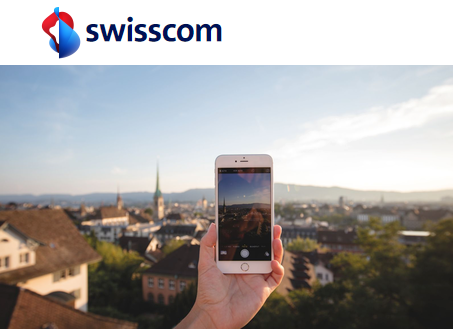 Swisscom has reached a host of 5G test milestones since: in the summer of 2017 Swisscom presented 5G applications like network slicing and speeds of 20 Gbit/s. Swisscom’s industrial partner, Ypsomed, uses 5G applications in the Industry 4.0 sector. 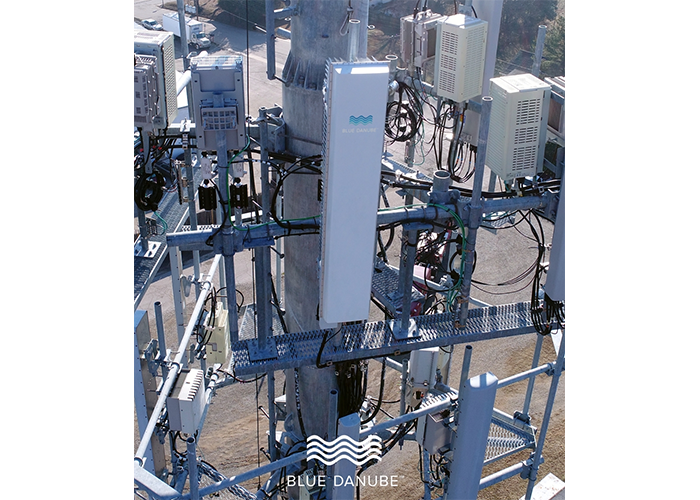 Blue Danube Systems announced the commercial deployment of its massive MIMO solution to multiple clustered cell sites. 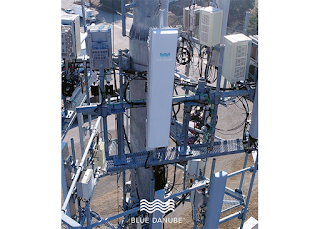 Blue Danube has performed multi-sector beam optimization using its BeamCraft 500 Massive MIMO systems at two different sites within the FDD-LTE network at a US mobile operator. The company said that it has not been clearly proven until now that Massive MIMO is deployable beyond isolated high-demand sectors where effects such as adjacent cell interference must be addressed. Its approach to Massive MIMO starts by assuring RF array coherency which in conjunction with digital processing uniquely enables the definition, placement and dynamic coordination of high precision beams that can be software engineered to minimize adjacent sector interference and actually improve clustered cell performance. SpaceX successfully launched the Low Earth Orbit (LEO) PAZ observation satellite on behalf of Hisdesat and two satellites of its own. Hisdesat Servicios Estratégicos S.A. is an international commercial provider of X- and Ka-band satellite communications services for government. 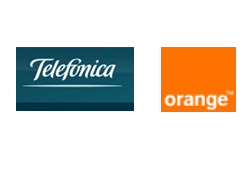 The company is based in Madrid, Spain. Its PAZ satellite is designed to capture Earth images with up to 25 cm resolution. For maritime monitoring, PAZ also features a sophisticated Automatic Identification System (AIS), simultaneously combining for the first time ship AIS signals and Synthetic Aperture Radar (SAR) imagery. Tintin A & B are the first two demonstration satellites for SpaceX's planned Starlink broadband satellite service. Both were successfully deployed into polar orbit and are communicating with Earth stations. In regulatory filing, SpaceX has revealed that its initial system will consist of 4,425 satellites operating in 83 orbital planes (at altitudes ranging from 1,110 km to 1,325 km). The system will require associated ground control facilities, gateway earth stations, and end-user earth stations. The system will use Ka- and Ku-Band spectrum. SpaceX has separately filed for authority to operate in the V-Band, where the company has proposed an additional constellation of 7,500 satellites operating even closer to Earth. To implement the system, SpaceX will utilise the availability of significantly more powerful computing and software capabilities. On the launch broadcast for the PAZ satellite, SpaceX said quite a bit of development work remains ahead on its satellite constellation plans. 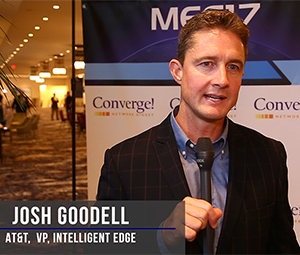 Telcos are rapidly evolving their central offices to be more agile, efficient and capable of delivering edge services for mobile and broadband users. This video panel discusses Central Office 2.0. 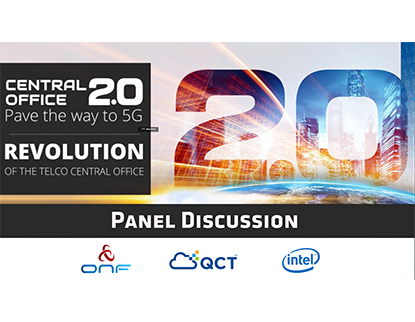 Participants include Mike Yang, President of QCT; Dan Rodriguez, VP of Network Platforms Group, Intel; and Bill Snow, Chief Development Officer, ONF. Where does the telco industry stand today in terms of the deployment of virtualized networks? In 2018: many changes will impact the network, including IoT and 5G. How are telcos rethinking their networks to take advantage of these opportunities? What can telcos learn from the hyperscale cloud providers who have been most successful in building the most efficient data centers? Based on operator returns to the regulator the following were the unit market-shares by operator during the quarter. 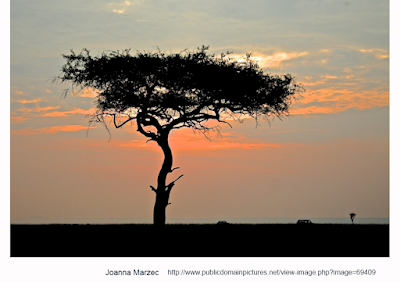 Safaricom was started in 1993 as a department of the former state-owned telecommunications company,Kenya Post and Telecommunications Corporation but is now owned 35% by Vodacom of South Africa(which is owned 65% by Vodafone of the UK), 35% by the Kenyan Treasury, 5% directly by Vodafone of the UK and 25% by the general public. Safaricom provides a wide range of integrated residential and business telecommunication services, including mobile and fixed voice, SMS, data, Internet and M-PESA, a service to send and receive money or pay for goods and services through a mobile phone. Due to Safaricom’s dominant share of the Kenyan mobile market, there have been frequent calls for the company to be broken up into separate retail and wholesale companies and for some time the CA was said to be considering whether Safaricom had abused its position and whether its various businesses should be disaggregated. Finally, on January 4th, 2018 the CA announced that it had decided not to take any action on this issue. Safaricom is Kenya’s most profitable company and claims to support over one million workers directly and indirectly. For the year to March 2017, Safaricom reported revenues of KSh 212 billion. For the first halfyear of 2017/18 ended September 2017, Safaricom reported good growth boosted by a strong performance by M-Pesa and data while traditional services such as voice remained resilient. -Data income up from KSh13.4 billion to KSh17.55 billion. -Voice revenue, which is still Safaricom’s biggest income stream, up from KSh45.7 billion to KSh47.35 billion. -Messaging revenue up 3.4% to KSh8.92 billion. Safaricom is a key contributor to the Kenyan Treasury through its payment of substantial taxes and dividends. In mid-December 2017 the Central Bank of Kenya in its weekly bulletin reported that the company had just paid KSh16.2 billion($157.3 million at KSh.0097 to the dollar) dividend to the Kenyan government. In early September 2017, Safaricom CEO, Bob Collymore, speaking to the Financial Times of London said the company was planning to market some of its services , notably Masoko, a service which combined e-commerce and mobile payments to four or five of its neighbouring countries, including Ethiopia, though he admitted the latter initiative might not be easy given the limited private sector in that country. As of late 2017, Safaricom was reported to have provided FTTH services to 81,000 homes in 19 neighbourhoods in Nairobi including South B and Pangani as well as Ngong and Rongai in Kajiado County. On December 11th 2017, Safaricom announced that for the first time ever, Kenya had achieved the milestone of 1 million active 4G customers in customers. Safaricom is currently the only operator providing LTE commercially. It said the milestone was achieved following network expansion, increased affordability of 4G smartphones and more affordable data bundles.